Régis’ fantastic oysters come from the Marenne-Oleron and are available for dégustation on the spot in the pale blue and white dining room, or to take home. Never fail to visit this restaurant each time i am in Paris. The boss is really friendly and so are the rest of the 2 staffs. The lady speaks English too. No doubt the space is small, but you are simply happy with the food. And the lady recommend great white wine to pair off with the yummy oysters. Hi Melinda, unfortunately the number of Paris restaurants who accept American Express is very, very low. AmEx used to have a search function online to tell which restaurants accept it, but I spent 10 minutes looking just now and could not find it. Expect to not use your AmEx while in Paris. Most places accept Visa and MasterCard but there’s an ATM within 2 minutes walking if Regis doesn’t. Have fun! Does the restaurant accept credit cards? Does it accept American Express card? Terrible and not professional service, not good value at all. In some restaurant they don’t think about the customers but about themselves, this is clearly one of them. Purely by chance our taxi stopped out in front of Regis. The owner saw my girlfriend’s face light up and he knew he had us. Needless to say we gave in and took a seat. We were talked into a couple dozen oysters and a nice bottle of champagne to wash it all down. Absolutely, LOVED the place. And the owner gave us a nice discount since he “roped” us in. It will not be an accident next time we show up. Highly recomended!!!! All: I just wanted to say that this discussion and these differences of opinion are exactly what we hoped to see a lot of when Meg had the brilliant idea to start PbM. I wish this thread could be up there for all to see and stimulate more frank discussions of serious food. The oysters were unbelievable. We had to wait for about 30 minutes, but were offered wine while we waited. We shared 2 dozen oysters, enjoyed our champagne and bread, and were not rushed to leave despite more people waiting outside. One waitress served the whole place, which was managable because it is so small, and we felt the service was completely adequate. We wanted to test this restaurant, because my wife love oysters … The reception was so bad that finally, we have not even been able to eat … Yet we used to go to restaurants and we already have good adresses but I’ve never seen that! We are arrived quite late on saturday night and it was full. Having spotted a nearby table to break free, we just waited and a couple arrives later and they pushed in front of us… Amazing: instead of tell to them we was first, the waitress found the situation was normal, because we didn’t ask enough quicky to her … Standing in front of the door for long time, near tables was not enough… Very curious to deal with customers! Worst service attitude we encountered in Paris restaurant during our stay. Very impolite. 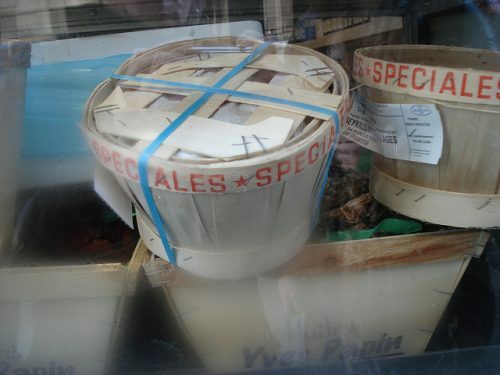 If it was the top of the best five oyster in Paris, it was also top of the rudest as well! The oysters were average to tasteless. The service really awful. No excuses, it was 19.00 on sunday! The waitress asked if I had finished with 3 oysters left (in Paris how can this happen?). Then she asked if I wanted cafe, which was part of the menu. Then asked later if I wanted anything else. Came back 10 mins later, asked the same thing, the answer was still “Non”. Then 10 mins more wait. Finally I go into the restaurant to pay. It wasn’t as if they were busy, so waiting was frustrating. The street is boring, as it ain’t Les Deux Margots! We split a dozen oysters and a dozen shrimp for a light dinner. With fresh bread and a pichet of Sancerre the experience was traditional and extraordinary. 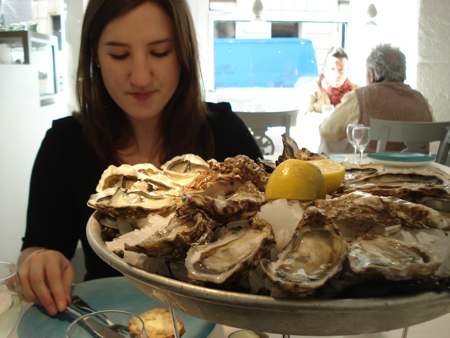 Seek out this 5 table room for the best oyster bar in Paris! I went here with a friend for their famed oysters and it did not disappoint. Since they don’t accept reservations, we had to get there early. We tried their “formule degustation” with glasses of Sancerre. The oysters were fresh and the service cheerful and friendly. I have found my alternative to driving to Brittany for the oysters!